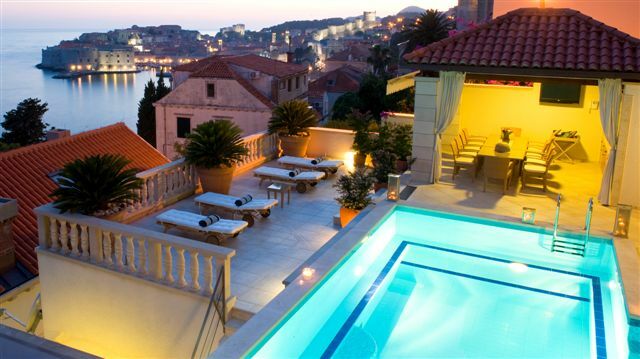 Amazing top luxury, historic and spacious villa with private pool, located in Dubrovnik's most elite and private residential neighbourhood in walking distance from the historic old city of Dubrovnik. This amazing historic house (built in 1938. and renovated in 2013.) is on the list of preventively protected monuments as a house of exceptional architectural value between the Two World Wars. The villa stretches over four floors; it is a spacious and very comfortable inside, quite a stunning villa of 500m² living space, 400m², garden and terraces. Villa has 5 bedrooms,and can accommodate 10 - 13 people, 6 bathrooms, and 1 toilet. Villa Art Deco is completely air conditioned; has wireless internet connection, LCD SAT TV and DVD player. Villa has a professional kitchen that is equipped with stove with 4 hot plates, oven, hood, dishwasher, fridge, freezer, microwave, electric kettle, toaster, coffee machine, blender, juice maker. Villa Art Deco to its guests also offers hair dryer, iron and ironing board, safe for valuables, washing machine and dryer, baby cot and high chair for the child. To relax a little bit more, villa offers jacuzzi (5m²) and sauna (for 2 persons), garden set, deckchairs the swimming pool (22m²) and terrace, umbrellas and everything else that is necessary to make your holiday the most pleasant. Villa Art Deco has a garage with two closed parking spaces and with four outdoor parking spaces. On this floor there is fully equipped kitchen, modern designed dining room with table and chairs and living room. On this floor there is also a bedroom with two single beds and en suite bathroom with shower, separate toilet. The ground floor is connected by an internal stone staircase to the first floor, where its place has found another living room with a large glass windows overlooking the Adriatic sea, beautiful island Lokrum and historic old city. Living room is equipped with design furniture armchairs, tables, sofa which can be used as additional bed for 2 persons. Modern designed dining room with table and chairs separated from the spacious bedroom equipped with king size bed, designed armchair and stunning sea view. On this floor, there is another bathroom and especially in salon, guests will experience the life in this villa from the past decades. The first floor is connected by another internal stone staircase to the second floor where you enter in special place reserved for relaxation and dreams. On this floor you will find 2 designer bedrooms equipped with matrimonial beds and modern bathrooms with bathtubs. One of the rooms have a balcony with stunning sea view where you can enjoy morning coffee or just read a good book. In part for relaxation there is a sauna for 2 persons with its own shower room where you can indulge all your senses. Special attention draws mirror room with luxury bathtub that is connected with attic. The attic features a beautiful designed bedroom with en suite bathroom and book corner where book lovers can enjoy reading fine literature. In front of the villa there are private gardens, jacuzzi, swimming pool, dining table and lounge chairs. 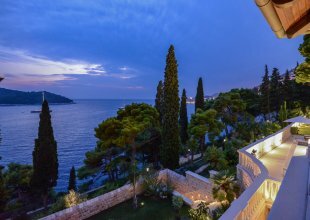 There is a stunning terrace overlooking the Adriatic sea, beautiful island Lokrum and historic old city to impress romantic souls. Particular attention is paid to external pool size 22 m², surrounded by comfortable chairs, umbrellas and lounge chairs for relaxing in the warm rays of the sun. Right here you will find much desired peace and feel the beauty of relaxation in the calm morning sipping hot coffee. Warm evenings filled with red and purple daybreak will reveal an exceptional beauty in dreamy and romantic sunsets that just the nature of this region is able to create. This section is intended for rest and relaxation; and enjoyment of culinary delights that can be prepared on an outdoor grill.